We’d love your help. Let us know what’s wrong with this preview of Changing Lives by Tracy Kincaid. What if love-at-first-sight was not the "first-sight" after all? Natalie Star is a modern woman, with modern sensibilities. Practical and realistic, she finds herself falling for a man named Thomas Andrews. Thomas is a perfect gentleman, but his love for her seems to be old, solid, staid—the kind that grows after years of love and life together. He speaks in riddles when sh What if love-at-first-sight was not the "first-sight" after all? Natalie Star is a modern woman, with modern sensibilities. Practical and realistic, she finds herself falling for a man named Thomas Andrews. Thomas is a perfect gentleman, but his love for her seems to be old, solid, staid—the kind that grows after years of love and life together. He speaks in riddles when she asks why he seems to know her so well—they were together in a time she can't remember yet. Thomas longs to tell Natalie everything he knows about her, about them. But it's time that is the problem yet. There is a tragedy that they must endure before she can fully accept who they are, and why they are destined to be together. A tragedy that Thomas has been through once, and will go through again to find the piece of his heart that has been missing all these many years. To ask other readers questions about Changing Lives, please sign up. Many people have tried to capitalise on the Titanic for their own writing but few have succeeded as Tracy Kincaid has. While there is a well done link to the past, the characters and their conflicts are strong enough to keep the interest up on their own. Intriguing we wait to find out who the mystery stranger is that sends our protagonist the dress and awaits to see her at the ball. A touch of cinderella romance is implied and I was as excited as she to find out more. 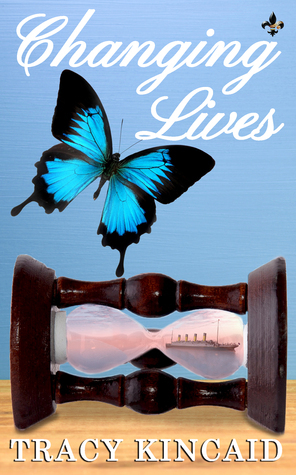 Romance and suspense with a h Many people have tried to capitalise on the Titanic for their own writing but few have succeeded as Tracy Kincaid has. While there is a well done link to the past, the characters and their conflicts are strong enough to keep the interest up on their own. I finished Changing Lives I think it is well written, has a fast pace, things seem to happen quickly, great imagination. A new take on the Titanic that is a pleasant surprise. This is not boring at all almost finished it in one night, but my eyes gave out. It is a fast pace, entertaining and refreshing new twist on the Titanic, there is a few pleasant surprises and twists that I enjoyed. This is a novel about a young lady trying to find herself and make it in the world when a handsome man comes I finished Changing Lives I think it is well written, has a fast pace, things seem to happen quickly, great imagination. A new take on the Titanic that is a pleasant surprise. This is not boring at all almost finished it in one night, but my eyes gave out. This is a novel about a young lady trying to find herself and make it in the world when a handsome man comes into her life and changes everything. This is a terrific novel and is nice to have a little fun and romance without the commitment of the "BIG book series" I usually read. I would recommend this book, I think it's fantastic. I have to admit that though the book was written well, it isn't my cup of tea and I had a difficult time really getting into the book. Changing LivesChanging Lives cover Tracy Kincaid is a pure, sweet romance with a supernatural twist. Pure romance does not capture my imagination as well as other genres and I cannot put myself into the shoes of a reader who loves strictly sweet romance. I do believe that romance readers will love this one. A twist on a timeless classic. The story is told in first I have to admit that though the book was written well, it isn't my cup of tea and I had a difficult time really getting into the book. Changing LivesChanging Lives cover Tracy Kincaid is a pure, sweet romance with a supernatural twist. Pure romance does not capture my imagination as well as other genres and I cannot put myself into the shoes of a reader who loves strictly sweet romance. I do believe that romance readers will love this one. A twist on a timeless classic. The story is told in first person present point of view. Though I generally do not have a problem with point of view, this POV made it difficult for me to feel the emotions and environment of the characters. I could not relate to the main character or love her hero as intended. Ms. Kincaid did do a good job of characterizing the romantic hero with the appropriate social mores of the time. He was a perfect gentleman and doted on the main character, but the story seemed slow to unfold for me. The mystery surrounding the romantic hero and how he is able to be where he is seemed a bit far fetched and inexplicable. The premise is a bit hard to believe, but, throwing out suspension of disbelief, this sweet romance has a great happily ever after ending. This book is very cleverly written and the topic is original and well researched. I really enjoyed the fresh idea and the fast pace of the writing. Growing up with this author I went in reading her book very criticality. Here are some examples I found, there was abundance of unnecessary conversations between characters also that there are many ways to say "I love you" rather than just saying those words. There was never an explanation on to why they were able to be together this time. But again I am just being overly critical and still loved the book. Very adventurous, very romantic and constantly engaging!!!! This book gave a unique twist to one of the oldest events and kept me so involved! The beauty and sweetness of the love affair between two very old souls was steadfast! Such a heart felt tale but it's hard to review without giving something away! It's epic just like the ship it revolves around and I'm a true believer in reincarnation!!!!! So I'm totally sold on this story !!!! This review has been hidden because it contains spoilers. To view it, click here. Disclaimer: The author of this book is the daughter-in-law of my husband's cousin. I'm not a big fan of romance novels, and I'm not really into stories with supernatural elements, and Changing Lives is a romance novel with supernatural elements (time travel, past lives, Bermuda Triangle). That said, I enjoyed reading this book. It is entertaining and sweet, a light and easy read with a happy ending. I absolutely loved it! Couldn't put it down til I finished it! Very interesting subject. I enjoyed reading the book so much I was depressed for some time after I finished reading. Can't wait for the next book! This is a lovely Sunday afternoon read. I was pulled straight into the story of Thomas and Natalie. Two soulmates searching for each other, and what happens when they do. Never was I ever into the paranormal. But I have found a new love for these types of books. Tracy Kincaid is an amazing writer of the paranormal love story. I love the Titanic! This book draws you in and doesn't let you go. It's as if you are in the story yourself, living in two worlds. The main characters are whimsical and I just can't get enough. I was given this book and was only asked for an honest review. I loved this book. A quick and easy read. I encourage everyone to get this book, it is worth your time and effort. I wasn't sure that I would like this book when I started it but it grabbed me before I finished the first chapter. I couldn't put it down. This is the first book I have read by Tracy Kincaid but it not be my last one. A wonderful story!!!!! I was not able to get interested in this book at all. I gave up after 10 chapters. Just very amateurish writing. Perhaps it would interest younger readers. I am a native Southern California girl who recently transplanted to Southwestern Pennsylvania. A wife and a mother of three. When I'm not writing you can find me reading or crafting. I enjoy the outdoors, whether it be working in the garden or hanging out with family and friends. “Changing Lives” is my debut novel. Release date July 20, 2015. I love to read and get faster with each book I read. My g I am a native Southern California girl who recently transplanted to Southwestern Pennsylvania. A wife and a mother of three. I love to read and get faster with each book I read. My goal is to read and write as much as I can. My favorite books are YA, NA, Erotica, Romance. Pretty much anything.